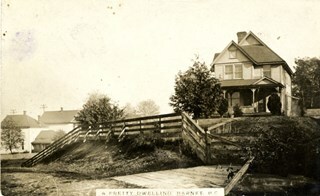 Photographic postcard of house in Barnet, BC, in which the image is entitled "A Pretty Dwelling." 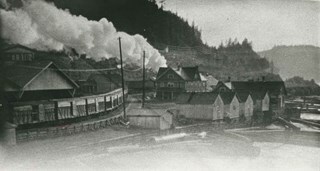 Photographic postcard of the mill in Barnet Village, BC. The image is captioned "Steady work and Keep, Barnet, BC." 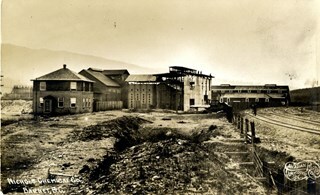 Photograph of the North Pacific Lumber Co. mill at Barnet. The plume of smoke is from a Canadian Pacific Railroad steam locomotive. 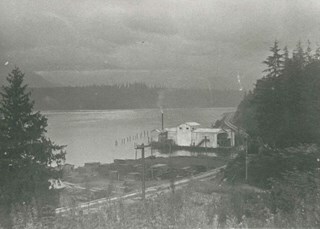 Photograph of the North Pacific Lumber Co. mill at Barnet, the largest in British Empire at one time. 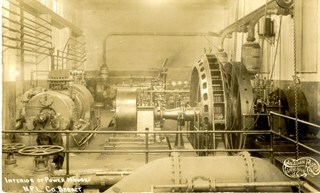 It was commonly known as Barnet Mill in the 1920s. 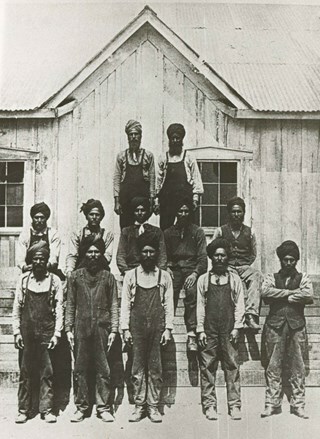 Photograph of twelve Indo-Canadian men wearing work clothes and turbans posed in front of a building of board and batten construction. Two men are standing on a stack of lumber, five are sitting on the stack, and five are standing on the ground in front of them. 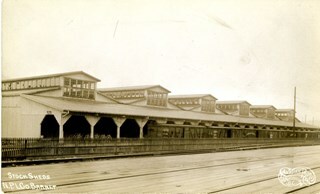 According to the accompanying note prepared by Burnaby Village Museum, the labourers are at the North Pacific Lumber Company mill at Barnet, which operated from 1899 to 1929 and completely closed out in 1931. 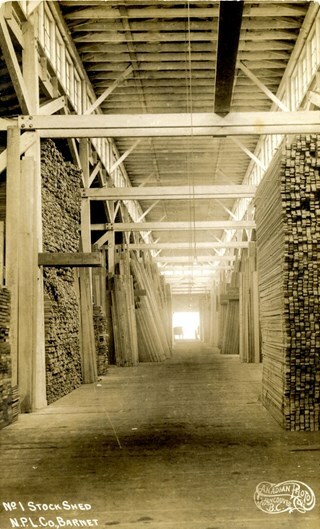 Photograph of lumber piled up and the skeleton of a building being framed during the rebuilding of the Barnet Mill after the fire of 1909. 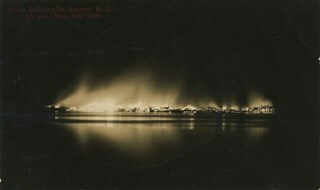 Photographic postcard of the line of buildings burning at the Barnet Mill, with flames and smoke visible rising from the structures. A caption stamped at the top of the postcard reads: "Mills burning at Barnet BC. 1:30a.m. May 6th, 1909." Photographic postcard of a labourer grappling with a large log on the log chute at the Barnet mill. 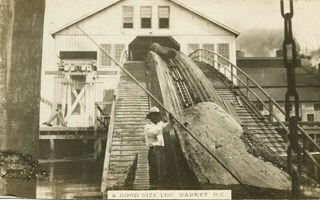 The caption to the card reads: "A Good Size Log / Barnet B.C." Aeroplane view of the Barnet Lumber Co.
Aerial photographic postcard of Barnet Lumber Company's Mill. 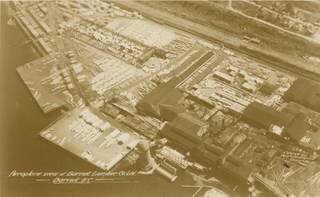 The handwritten caption on the lower left corner of the postcard reads: "Aeroplane view of the Barnet Lumber Co. Ltd./ Barnet BC." 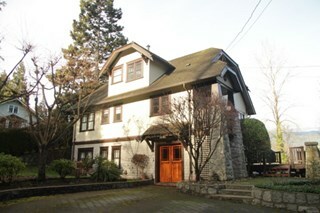 The handwritten caption on the lower right corner reads: "Copyright 1927/ Pacific Airway Ltd./ Vancouver B.C.". Photograph on a postcard shows row of houses along a street at Barnet Village. The postcard is postmarked July 30, 1912, Barnet, from Evelyn, who had travelled to Barnet, to her mother, Mrs. John Laity in Port Hammond, BC. 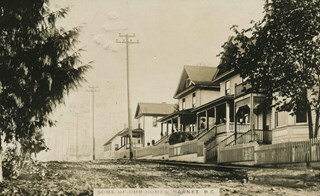 Caption at bottom of photograph reads, "Some of our homes, Barnet, B.C." North Pacific Lumber Co. Barnet, B.C. 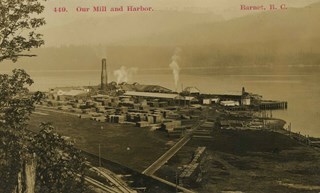 Photographic postcard of the North Pacific Lumber Co. Mill at Barnet Village in Burnaby. Title on recto of photograph in red reads: "438. 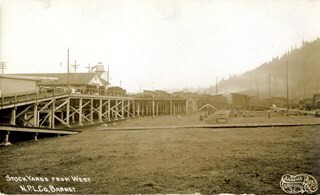 North Pacific Lumber Co. Barnet, B.C." Stamped in red on verso: "Timms Photographic Co., Vancouver, Canada." 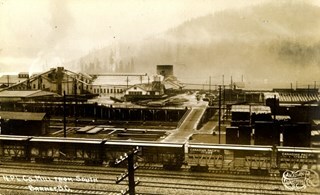 Stamped in black on verso of photograph: "Post Card / Correspondence / Name and Address / Place Postage Stamp Here"
Note in pen on verso of photograph reads: "Alan Fish / 604 733 0459"
Photographic postcard of the dry kilns at the North Pacific Lumber Company in Barnet Village, BC. 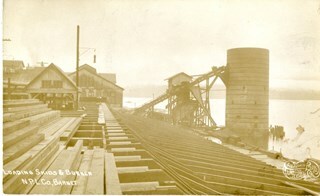 Photographic postcard of the sorting table at the North Pacific Lumber Company in Barnet Village, BC. 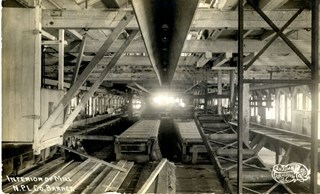 Photographic postcard of the interior of the mill at the North Pacific Lumber Company in Barnet Village, BC. 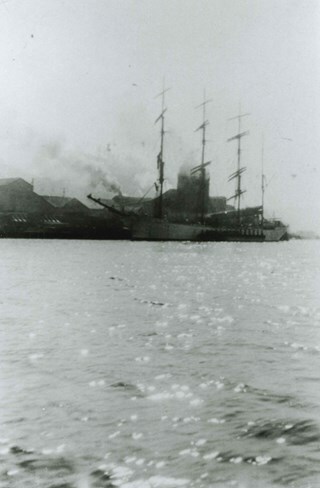 Photographic postcard of No. 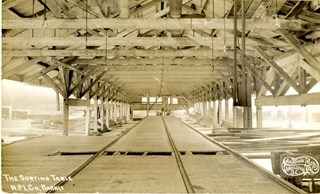 1 stock shed at the North Pacific Lumber Company in Barnet Village, BC. 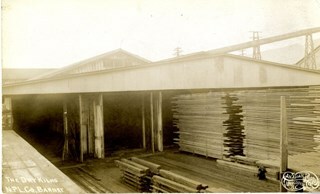 Photographic postcard of the exterior of the stock sheds at the North Pacific Lumber Company in Barnet Village, BC. 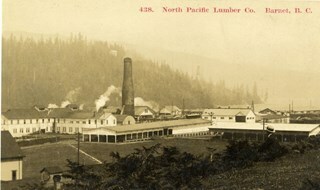 Photographic postcard of an image of the North Pacific Lumber Company, located in Barnet Village, BC, from the South. 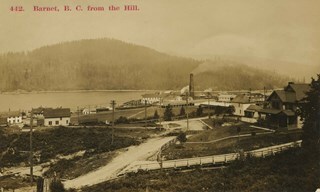 Photographic postcard of Nichols Chemical Company in Barnet Village, BC. 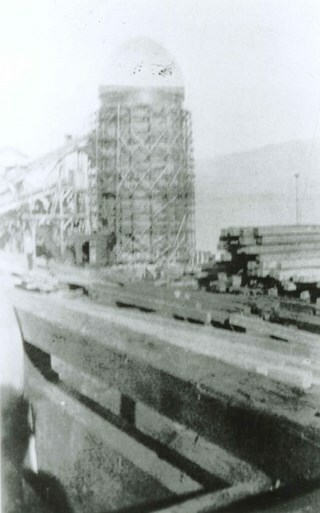 Photograph depicts the construction of the building. 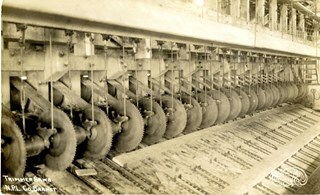 Photographic postcard of the trimmer saws used at the North Pacific Lumber Company located in Barnet, BC. 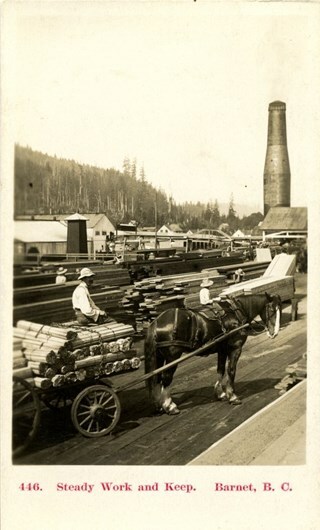 Photographic postcard of the stockyards at the North Pacific Lumber Company located in Barnet, BC. The photograph is taken from the west. 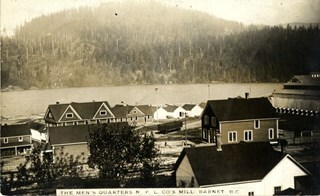 Photographic postcard of the men's quarters for those who worked at the North Pacific Lumber Company in Barnet, BC. 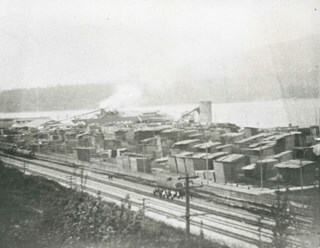 Burrard Inlet is also depicted in the background of the image. 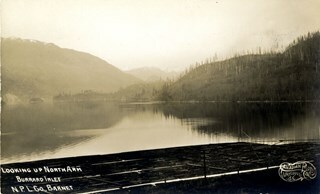 Photographic postcard of an image looking up the north arm of Burrard Inlet from the North Pacific Lumber Company in Barnet Village, BC.